A fan favorite, women’s volleyball player Anne Carroll Ingersoll knows how to excite spectators with earth-shaking spikes and back-breaking blocks, eliciting cheers of “IN-GER-SOLL” from the crowd. But that is far from the craziest thing Ingersoll has heard a fan yell, as she reveals in this exclusive interview. Every week, The Full-Court Press will give you the sort of personal scoop that you’re not likely to hear at a typical press conference. Stats: After winning Ivy League Rookie of the Year as a freshman, Ingersoll led the Crimson as a sophomore in total blocks with 92 and finished second in total kills with 233. 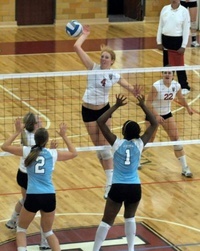 Ingersoll also managed to finish sixth in the Ancient Eight in hitting percentage, with an efficiency of 29.8-percent. My meal always consists of a bowl of Cocoa Rice Krispies. Always. The way they turn the milk chocolaty is magical and makes me believe that anything is possible. 2. List four songs you listen to before games to get pumped up. I get pretty attached to the pre-game warmup CD our team puts together every season. Last year my favorites were "Replay" by Iyaz and Miley Cyrus' "Party in the USA"
3. Favorite team to play against and why? Yale, because it's always personal. 4. Most ridiculous thing that has taken place in your team's locker room. 5. Most embarrassing moment you've had on the court. I don't get embarrassed very easily on the court. Or maybe I just decide to block those moments out. I do tend to trip over myself a lot or fall unnecessarily which is always awkward. 6. Animal that best represents your style of play and why. My teammates say that I am a seahorse. I wasn't sure what that meant concerning my style of play so I wikipedia'd it. Turns out they swim "very poorly," so I really hope my teammates aren't trying to tell me something. 7. Most ridiculous thing you have heard a fan yell at a game you were playing in. I have gotten pretty good at tuning fans out, but freshman year there was this guy at our tournament in Florida who kept threatening to cut my ponytail off. That was kind of weird. 8. If you could play for another sports team at Harvard, which would it be and why? 9. Position you would play in Quidditch. I would definitely be a beater. They exist to smash balls at the other team while protecting their own team from opposing beaters. Not only does this sound awesome, but it is basically what I do in volleyball. 10. If you could go on a date with any professional athlete, who would it be and where would you take him/her? I would go on a date with Shaun White. After a day of snowboarding, we could discuss being from San Diego and brainstorm how to keep gingers from going extinct over some California burritos.